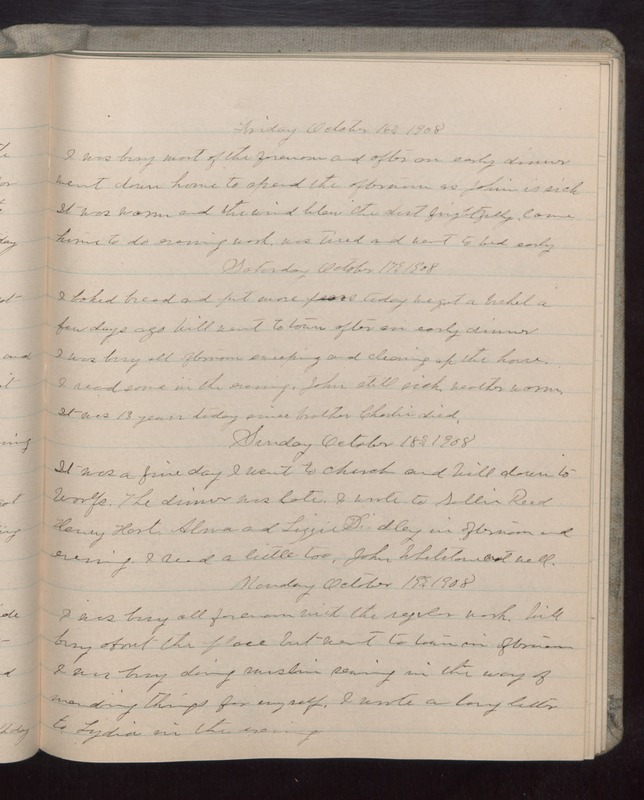 Friday October 16 1908 I was busy most of the forenoon and after an early dinner went down home to spend the afternoon as [illegible] is sick It was warm and the wind blew the dirt frightfully. came home to do evening work. was tired and went to bed early. Saturday October 17 1908 I baked bread and put more [pears?] today we got a bushel a few days ago Will went to town after an early dinner I was busy all afternoon sweeping and cleaning up the house. I read some in the evening. John still sick. Weather warm. It was 13 years today since brother Charlie died. Sunday October 18 1908 It was a fine day I went to church and Will down to Woolfs. The dinner was late. I wrote to Sallie Reed Henry Hart. Alma and Lizzie Lindley in afternoon and evening. I read a little too. John Whetstone not well. Monday October 19 1908 I was busy all forenoon with the regular work. Will busy about the place but went to town in afternoon I was busy doing muslin sewing in the way of mending things for myself. I wrote a long letter to Lydia in the evening.